One of the most common knots used in fly fishing is the clinch knot. 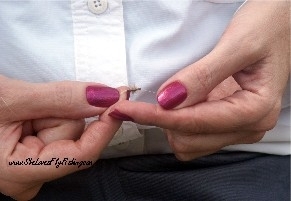 Let’s focus on tying your tippet to your fly – we’ll work backwards and cover other fly fishing knots later. This is the knot you will use most frequently since you’ll be changing or losing bugs on a regular basis. The basic knot is called a CLINCH KNOT. Step Two: Hold the fly in your left or non-dominant hand making sure you hold a small loop open right next to the eye and use your dominant hand to wrap the end of the line around the main line a minimum of five times. Step Three: Take the free end and push it through the little loop you kept hold of in your left hand. Pinch it with your thumb and forefinger and hold on to it. Step Four: Now lick it, spit on it, or dip it in the river for lubrication and tighten it down by pulling the main part of the line and the fly in the opposite direction. DO NOT PULL ON THE TAG END – just pinch it together with the fly. Step Five: Now clean it up by trimming that tag end and you’re good! Leave Your Hat On Video - Clinch Knot at 2:30 NOTE: You’ll hear about the “Improved” Clinch Knot but that’s the knot that has come undone on me too many times to count so I've gone back to the basic clinch. You have to do it perfectly or it’s useless. But Sabrina, that's what you were tying in the video! I know. Old habits die hard.